Meetings are tough. Too many meetings can ruin your whole work week and cause you to get nothing accomplished, while too few meetings or meetings that aren’t effective can have the same effect on your teamwork. Finding the right balance of time spent, productivity, and collaboration is the key to making meetings work, but most people aren’t focusing on the right things. Learning how to make meetings work for you is the key to success in business in any sector. How much time is wasted on meetings? 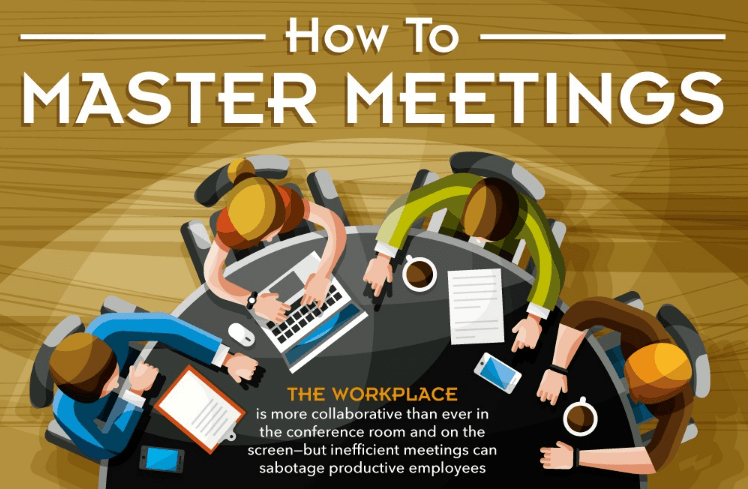 The average person spends nearly 12 hours a week preparing for and attending meetings. A lot of that time is wasted on things like trying to get your tech to work, dealing with internet interruptions, and getting the attention of folks who are doing other things instead of paying attention. In the average 38 minute call, 8 minutes are wasted getting started with greetings and banter, 13 minutes are wasted with interruptions and distractions, and there is only about 17 minutes of productive meeting time. Even meeting rooms pose problems – how often do you walk into a meeting room and everyone is able to instantly connect to the internet without any issues? Listen, no one wants you to spend all week laying out guidelines for meetings. “Planning for meetings is almost as much of a waste of time as wasting time in meetings,” says Alex France the director of Design Bundles. But you do need to set clear goals. Are you catching up in a status meeting or is there some sort of major decision everyone needs to be prepared to plead their case for? Just a quick email laying out the guidelines for what the meeting is about and then end goal will help keep everyone on track. Is it time for a tech check up? More meetings today happen online or over than phone than in real life, a dramatic shift made possible by the wonders of the Internet. Conference calls are nothing new, but video conferencing and other collaborative meeting tools are straight out of Star Trek. It’s just a matter of time before we are having meetings through virtual reality or augmented reality. If you’re still dialing in to the conference line on a regular basis it may be time for a refresher – there are some new options available to make your meetings more productive. Utilizing better tech can lead to less stressful and more productive meetings. Among workers who want better meetings, 51% say they want tech that works at the touch of a button, 44% want wireless meeting tech, 44% want their meeting tech to work seamlessly across different devices, and 40% want to conference with colleagues in multiple locations more simply. Keeping documents where everyone on the project can access them is a big time saver. So is making sure everyone is trained to use the same collaborative tools to work on projects. When projects run more smoothly, meetings follow suit. Virtual and Augmented Reality tech can make long-distance meetings seem closer, but there are lots of other 21st century tech solutions that can make meetings more effective. Interactive whiteboards, screen sharing, and mind mapping technologies help to keep everyone on the same page in a futuristic way. Screen sharing is a great way to ensure people at multiple locations have access to the same information, while interactive whiteboards and mind mapping can help visualize what’s on your mind during active collaboration times. Mastering meetings is about more than just showing up and listening the whole time. It’s about planning ahead and making your collaboration as efficient and effective as possible. Set clear goals and upgrade your tech and watch the magic happen. Are you ready to take your meetings to the next level?